Last year’s ‘temporary’ bridge over the Derry Burn, near Derry Lodge, has now become permanent. And a new footpath is to be developed going around – rather than across – the Derry Flats. ScotWays, the Scottish Rights of Way and Access Society, donated the footbridge to Mar Lodge Estate last April, as a temporary replacement for the bridge destroyed by floods the previous August. 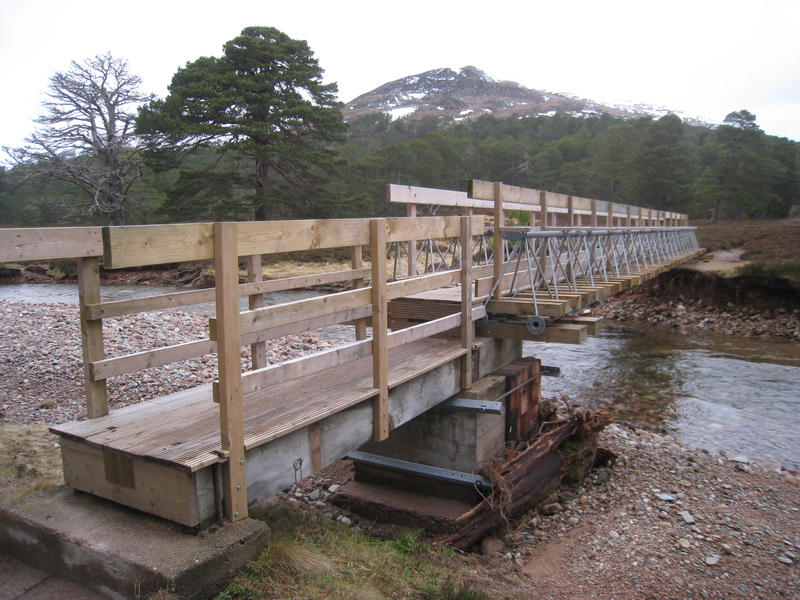 The original plan was for this bridge to stay in place until a permanent replacement had been built but after the New Year floods at the end of 2015 left the bridge still in place, and after other options had been considered, ScotWays and Mar Lodge Estate have agreed to make this the permanent bridge. ScotWays is keen that the banking is reinforced and the abutments strengthened – although the bridge was untouched by the last floods, the western bank was further eroded – and has also said it will fund construction of a new footbridge across the upper Quoich, which is expected to be in place by the end of November. Both bridges will feature memorial plaques to Donald Bennet, a prominent member of the Scottish Mountaineering Club, founding member of the Mountaineering Council of Scotland and, at various times, Director, Chairman and Honorary President of ScotWays. He will be best known to most, though, as author of numerous books, including the SMC’s definitive Munro and Corbett guides. He died in 2013, aged 84. Any funds left over after the two bridges are built will be used to divert the path that currently traverses the boggy Derry Flats, taking it down the west bank of the Derry Burn and then up the north bank of the Luibeg to join the existing path where it becomes a ‘made’ track at the corner of the plantation. This has been a long-held ambition for the estate, not only giving walkers a drier journey, but also taking them further away from the Black Grouse lecking ground on the Flats. This entry was posted in News and tagged derry bridge, derry flats, floods, quoich bridge. Bookmark the permalink. Is there any news on a replacement bridge at Carnuchian on the Feshie? I’ve not been able to find out anything online. Hi James, I haven’t heard anything other than that there are no immediate plans. The estate don’t respond to emails and all I’ve heard is gossip that they’re just as happy to channel folk down the east bank, but I don’t know how reliable that is. Original plans to replace the bridge were stymied by some planning permission hitch, so maybe that’s behind the lack of bridge? Good news Neil…..I take it the other proposed bridge,(talked about last month ) will not be going ahead then? No, the main Lairig path will go to the current bridge and then follow the very edge of the Derry Flat, so it won’t skirt the bothy or go over to the south bank of the Luibeg. Makes sense as long as the bank doesn’t wash away from under the bridge. I thought the tree ‘bridge’ was great. Thanks for the update. Is the Upper Quoich replacement for the closed footbridge at the Punchbowl or for the one washed away higher up. If the latter wot news of the Punchbowl bridge ? Not 100 percent certain, but I believe it’s the higher one. Was up the Quoich recently and to me, the only problem with the bridge at the punchbowl was the barricade closing off the bridge. Are they waiting for an engineers report? Seem to recall that bridge being blocked off years ago… or was that a previous version? That,s great news Neil….nae second bridge . Donald Bennett – I’d have to get a calculator but in Alistair Borthwick’s ‘Always A Little Further’ (my favourite book), he credits some of the photos of him (front cover for one) as taken by Donald Bennett. I see a lot of the SMC’s Munros book photos are credited to him as well. I’m not sure if it can be the same one as Borthwick was in his 20s in the 1930s. Anyway, I haven’t got my calculator upstairs and am listening to music while I type so don’t have any spare brain to do the maths. Do you think it would be the same one or is it just a common name? Donald Bennett would certainly have been younger than Borthwick, but there’ll have been a considerable overlap – and I don’t know of the cover pic (I have the Diadem edition) is actually of Borthwick, but if it is him climbing then he’s considerably older than he was when he was writing the book. So yes, only one Donald Bennett, but a very busy and prolific Donald Bennett. That’s why he was (and still is) thought so well of. I suppose there would be an overlap and Borthwick doesn’t look that young on my cover – he has a dark beard though so not too old as it hadn’t yet gone grey. He’s climbing on Ben An on my cover – is that the same as yours? The Diadem Book cover is “Climbing in the Trossachs” The photo is credited to Donald Bennett and not a photo of him or Alistair Borthwick. Gordon Bennet…i never knew that Sinbad . Piper, it’s nae Gordon, it’s Donald. As in duck!! Does anyone know if the bridge was rebuilt above Moulzie on the way up to Bachnagairn?